Welcome one and all to another Meet The Manufacturer! This time it’s San Jose, CA based Yamachan Ramen!They make fresh ramen products – here’s the interview I did with them. THE RAMEN RATER> Thank you very much for agreeing to do this interview! Could we start off with　Some information about Yamachan; when was Yamachan founded, where and by who? 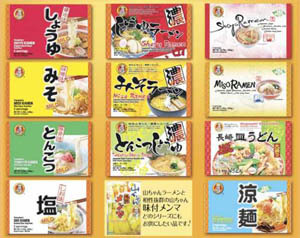 YAMACHAN RAMEN>Yamachan Ramen is a brand name for our retail products. Our company’s official name is Nippon Trends Food Services, Inc. (NTF for short), which was found by Mr. Hideyuki Yamashita (the president of the company-A.K.A Yamachan) in San Jose, CA in 2000. The factory was originally built as a central kitchen for Japanese franchise restaurant Ringer Hut.co (http://www.ringerhut.co.jp). Ringer Hut had a plan to open 100 restaurants in US late 90’s, but Ramen wasn’t popular (or unknown to the most of the people in US), so Ringer Hut, Co. only opened 2 restaurants and left the USA. (Although the company left here, their 1st restaurant is still in San Jose, CA www.ringerhutusa.com ). It was president of the Ringer Hut’s dream to introduce Japanese ramen noodles to US, so Mr. Yamashita stayed in US with his family to continue on manufacturing noodle products. You tell us a little about them? YR> We have several items in the market for customer’s needs. Our products are not dried instant noodles that you see at the supermarket. It takes few steps to make it but you can enjoy Ramen almost as well as you eat at restaurant. For the basic ramen fans. Yamachan Mild (regular) series-all soup base for these products are imported from Japan and contains no meat products in the soup base. (Some fish products in the base). We also have Tonkotsu (pork and chicken) flavor. However, this product has been out of the market for almost a year but it will be back in the market soon. Tonkotsu Ramen series contains Chicken and pork in the soup base and it is made in US. Yamachan Noukou (Richer flavor) series-all soup base for these products are imported from Japan and no meat products in the soup base. (Some fish products in it). Noodles for Noukou series are made from premium Japanese flour. TRR> What does the name ‘Yamachan’ mean? YR> Yamachan is a nickname for Mr. Yamashita’s last name. The character of the man with on the package is Yamachan. TRR> Is Yamachan involved in the local community around you? YR> Yes. We do donate our products to local Japanese community events or school charity. Also Mr. Yamashita goes to cook at Japanese community events every summer. TRR> Are there any new products that will be coming out soon that you could tell us about? YR> Shio (Sea food flavor) just came out about 6 months ago. Our Tonkotsu Ramen will be back to the market in November. We are also developing allergy free, egg free, no gluten ramen. TRR> A lot of people wonder about the health factors (sodium, etc.) when it comes to instant noodles. How do you recommend people made instant noodles a healthy part of their diet? YR> Ramen soup is well known to have MSG in it. We offer No MSG retail products for the customers who are concerned about MGS products. Also ramen soup contains a lot of sodium but if you only have 1/2 of the soup, your sodium you will only have 1/2 of the sodium. Try to eat fresh/ locally instant noodles like Yamachan ramen. TRR> Do you make/sell products other than instant noodles? We also manufacture crispy noodles, Pot sticker skins, Udon, Buckwheat noodles…. etc. YR> Yamachan Shoyu ramen and miso ramen. TRR> How does the process in which you make your noodles differ from other brands? YR> We made the noodles just like the factory in Japan. Our machines are from Japan and flour is milled by Japanese technique, and we go Japan to find the best soup that matches to our noodles. TRR> When you make instant noodles for yourself, do you add anything or have any recommendations? I think for topping wise, you can put anything you want to. I like to put small chopped raw onions on Noukou Tonkotsu Shoyu Ramen. The best way to cook them is to FOLLOW the cooking instruction on the package. Use cooking timer and measuring cup to make exactly how to cook. That is the best way. You can check how to make Chashu and a half cooked eggs at This page. TRR> Where can people find your products? YR> Most of the Asian supermarket nears you. If you cannot find them, please contact us via website. TRR> Thank you very much for this opportunity to learn more about Yamachan Ramen! This entry was posted in * Meet The Manufacturer, United States and tagged 98026, asian, asian instant noodle soup, bowl noodle, buckwheat, ca, california, chinese, chow mein, edmonds, eggs, flavor, fried noodle, hans lienesch, indomie, instant noodles, instant ramen noodles, japanese, korea, korean noodles, lienesch, maruchan, meet the manufacturer, mi goreng, miso, nissin, noodle, northwest, ponpoko, pork, Ramen, ramen blog, ramen blogger, ramen rater, ramen recipe, ramen review, ramen reviewer, ramen reviewers, ramen reviews, ramen video, ramenrater, ramenrater.com, ramyeon, ramyun, rater, rating, ratings, review, reviews, saifun, saimin, san jose, sapporo, seafood, seattle, shin ramyun black, shio, soba, soup, soy, soya, spicy ramen, tanuki, tempura, thai, the ramen rater, the ramenrater, theramenrater, theramenrater.com, tonkotsu, top ramen, udon, united states, usa, washington, wheat, wheat noodle, yakisoba, yamachan, yamachan interview, yamachan ramen, yamachan ramen interview, yamashita on October 2, 2012 by Hans "The Ramen Rater" Lienesch. Do they still make ramen noodles? I have tried to find them, I guess Nippon Foods makes them but no one answers their phone.